Dimensions (inches): Parchment: 3" x 2.5", Bird Image: 2" x 1.75"
Child's watercolor drawing of a small pink rooster with a yellow head and comb. The work was clipped from a book of schoolwork that was found in Lancaster County. On the reverse, among other text written in a dip pen, is "32 lbs. of cheese". Since paper was less expendable in the 19th century and little was wasted, a younger sibling was probably given this on which to draw. 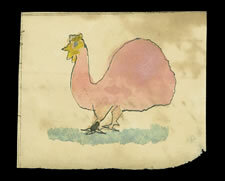 Size of Parchment: 3" x 2.5"
Size of Bird Image: 2" x 1.75"